That up there is Boston Dynamic's "Cheetah", a new robot that can run at a speed of over 28.3 miles per hour. Faster than Usain Bolt. Faster than any human alive. Oh, faster than that electric scooter of yours as well, so don't get your hopes up. 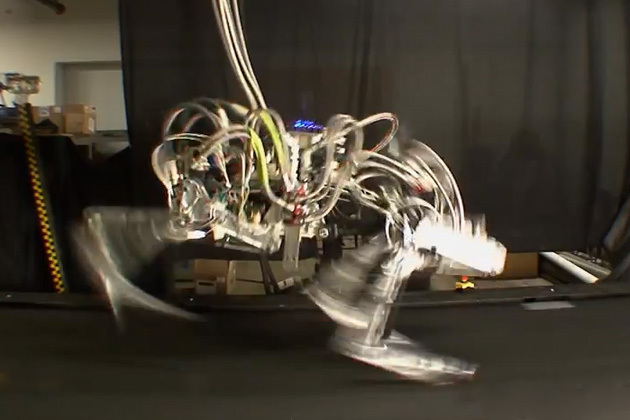 The robot has an articulated back that flexes back and forth, much like fast animals do. Yes, they are mimicking animals, and they are doing a damn good job at it. The project is currently in pre-beta stage, and has many fatal flaws. Cheetah can only run in a straight line on a treadmill, held by a boom, which is the only way it can maintain balance. So, you are not entirely doomed. As of now. 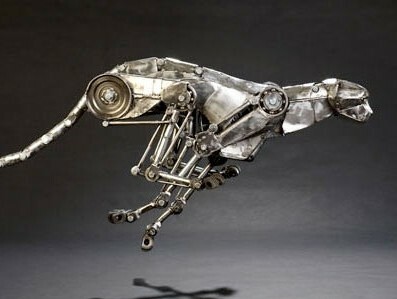 The new version of the Cheetah, named the WildCat, is designed to perfomred untethered from any support device. Much like any other robot that Boston Dynamics has designed in the past, the tread-mill defiler is sponsored by DARPA and will most likely be used by United States military forces, although it will probably find some uses in the civillian world as well (pet murder machine anyone?). Field-testing on an independently upright versiob has already begun last month. I'd wish you sweet dreams, but, you, know, I think I'll just go and take a nap in my incredible skyscraper instead.